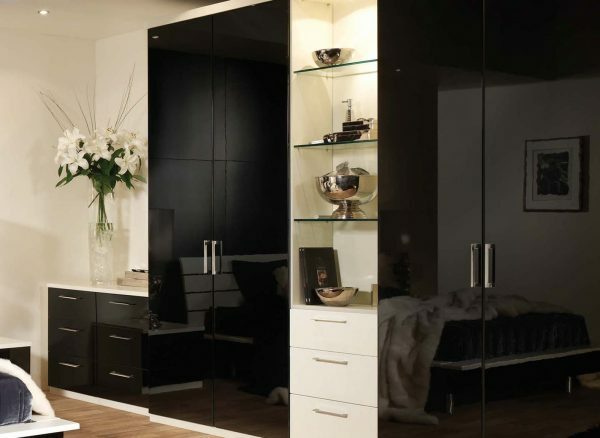 Add drama to your bedroom with our Portofino range in Gloss Black and Alabaster White. Its bold contrast and lustrous shine is instantly striking and will give you a space that undoubtedly stands out from the crowd. Portofino’s breathtakingly good looks are mirrored with generous amounts of storage behind the high gloss doors. Your bespoke fitted wardrobe will be designed to provide all the hanging space and soft close drawer units you need. To ensure all your bespoke furniture flows together, your contemporary bedroom suite can be configured to include freestanding pieces. Made to match and personalised with your choice of finishing touches, these drawer units and bedside tables will provide extra storage and style. To continue the two tone colour scheme of this Portofino bedroom and add an extra eye-catching feature, the bed frame is finished in monochromatic shades. The white finish of the ledge section sits on top of the black base, creating a striking juxtaposition that looks as contemporary as it does chic. Proudly display your pictures and treasured items with our glass shelving. The sleek looking units can be included in your wardrobe design, as a full shelving unit or a split drawer design, complete with integral LED lighting.